Clearly I am a rather large child because I think this is one of the most fun balloon backdrops we’ve done so far! 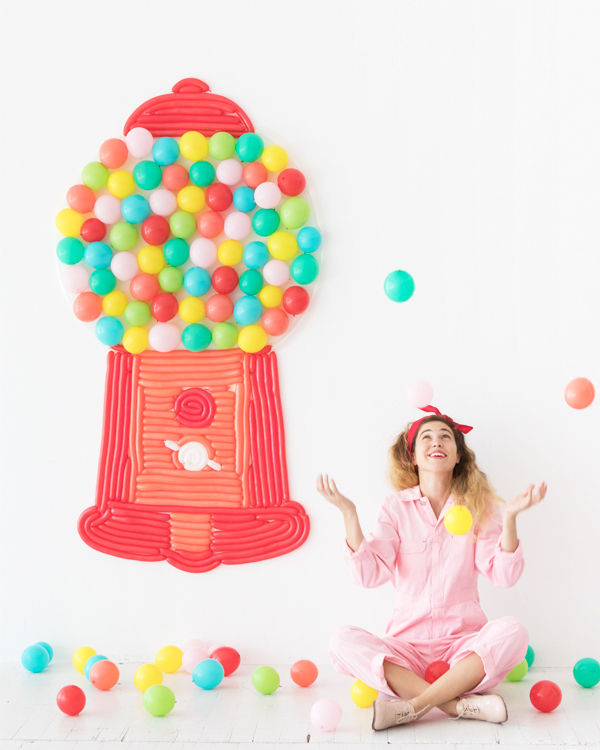 A classic, red gumball machine with GIANT gumball balloons- in ALL the pretty colors. It would bring pure joy to a party, guaranteed. Read on to find out how we made it! Step 1: Download the Gumball Machine PDF, or an image of a Gumball machine that you like, and project it onto a large blank wall. Lightly trace the design with a pencil. Step 2: Apply strips of double-sided Shurtape along and within the gumball machine outline and peel of the paper backing. Step 3: Step 3: Inflate a bunch of red and coral 160Q balloons. Release a bit of air from each balloon before knotting, so that the balloon has less tension, then trim off the balloon tails. Step 4: Fill in the design with balloons, starting with the outline of the base and top of the gumball machine. Use white 160Q balloons for any additional details. 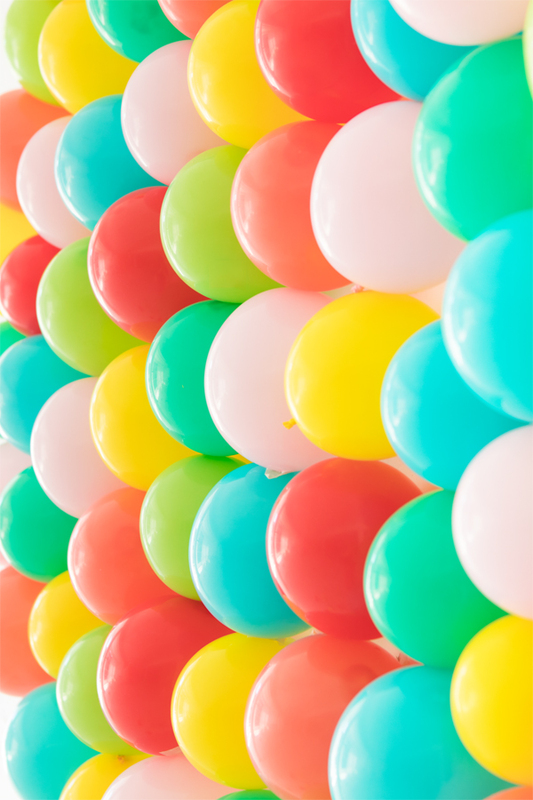 To make balloons to size, inflate a balloon to the length that you need, knot both ends, and trim off the leftovers. Step 5: Inflate two clear 160Q balloons and stick them along the outline of the clear part of the machine. Step 6: Inflate 5” mini balloons in all colors until they are round in shape. 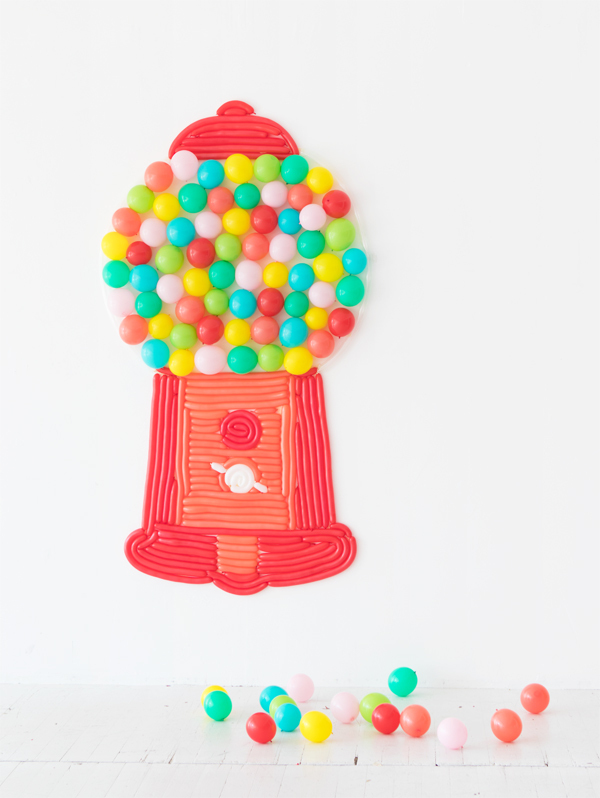 Knot the balloons and trim off the tails to make round gumballs. Step 7: Attach the gumball balloons to the wall with small pieces of Shurtape. So awesome! Seriously magical! I wish I had a party to throw! So so cute! Everything is perfect! Those balloon gumballs are the best! Where are these coveralls from? I’m obsessed!